This delightful Indian dish makes a great side. You may have tried a similar version with cheese (called saag paneer) at an Indian restaurant. This vegan version allows everyone to enjoy it. Peel the potatoes and cut them into roughly one-inch chunks. Add them to the slow cooker along with the sliced onion, water, crumbled stock cube, oil, spices, and plenty of black pepper. Finally, add the spinach. Cook on medium for around 3 hours, until the potato is soft, stirring every hour or so to scrape down the sides. The exact cooking time will depend on exactly how big you cut your potato chunks. This easy crock pot chicken and dumplings made with biscuits is delicious! 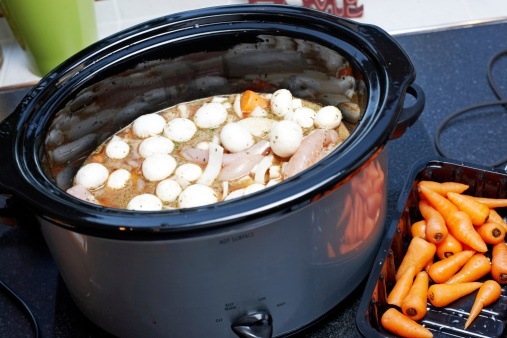 Place the chicken and veggies in the crock pot. Add in the cream of chicken soup and seasonings. Pour water and broth on top. Cook on low for 6 hours, or high for 3. Once cooked through, shred the chicken and place back into the crockpot. Cut up the biscuits and place on top. Let cook on high for one hour or low for two hours, stirring twice during that time. Serve with salt and pepper. Yes, it’s possible to make even meatloaf in the crock pot! Here’s how. Combine first 6 ingredients, 1/2 cup ketchup, and 1/4 cup water; shape mixture into an 8- x 4-inch loaf. Line bottom and sides of your slow cooker with aluminum foil, allowing 2-inches to extend over sides. Lightly grease foil. Place loaf in slow cooker. Stir together brown sugar, mustard, and remaining 1/2 cup ketchup; spread over top of loaf. Cover and cook on low for 5 to 6 hours or until a meat thermometer registers 160°. Lift loaf from slow cooker, using foil sides as handles. Let stand 10 minutes before serving. Cover and cook on low 3 1/2 hours or until a meat thermometer registers 160°. This is a crowd-pleaser you can serve at your next brunch or other gathering. In your crock pot, combine the milk and coffee. Whip together the pumpkin, vanilla, sugar, and cinnamon. Pour mixture into the crockpot. Stir everything together and then toss in 3 or 4 cinnamon sticks. Cover the crockpot, and cook on high for 2 hours. Finally, you can make delicious desserts in your crock pot as well. Spray the inside of your slow cooker with non-stick spray. In a medium bowl, mix the flour and baking powder together; set aside. In a large microwave safe bowl, melt the butter and chocolate in the microwave in 30-second increments, mixing between each increment, cooking until melted (this step shouldn’t take more than 2 minutes). Adding to the butter mixture, whisk in 2/3 cup of sugar, 3 Tbsp of cocoa, vanilla, salt, milk, and egg yolk. Add the flour mixture and stir until thoroughly mixed. Pour the batter into the slow cooker and spread it evenly. In a medium bowl, whisk together the 1/3 cup sugar, 1/3 cup brown sugar, 1/3 cup cocoa and hot water until completely mixed together. Pour the mixture over the batter in the slow cooker. DO NOT MIX. Cover and cook for 2 – 3 hours on high, checking at the 2-hour mark. The cake should look done, and the sides of the cake will be away from the sides of the slow cooker. The larger your slow cooker, the shorter the cooking time will be. Remove the lid, taking care not to drip water from the lid onto the cake, and allow to cool for 30 minutes. Serve topped with ice cream or whipped cream.